UTV Market Value « Global Market Insights, Inc. The exponential growth map of the global UTV market can be aptly credited to the rising preference for a UTV in numerous in utility activities. In an effort to diversify their product offering, major UTV manufacturers are lately focusing on developing vehicles that can address different requirements from a varied array of application segments, including agriculture, construction & forestry, which serve to further propel the UTV market growth over the forthcoming years. Moreover, to keep these vehicles relevant for a particular application, industry players are also introducing new accessories, machines & attachments, which makes these already popular vehicles a must-have tool, thereby ensuring sustained growth for the UTV market. It is prudent to mention that the industry is also receiving momentum from the improving global economic conditions leading to increasing disposal incomes, that has resulted in the popularity of UTVs growing exponentially for recreational activities, such as fishing, hunting & off-roading. The United States’ outdoor recreation market is known to be one of the nation’s largest economic sectors. The sector represents a sizable economic growth avenue that supports thousands of communities in America by facilitating millions of job opportunities for workers. The industry is largely supported by the nation’s bountiful waters, inspiring landscapes and iconic natural beauty. Thus, investments in this sector on public waters & lands are capable of earning compounding returns, promoting healthier economies, communities & people. According to the Outdoor Industry Association, the U.S. outdoor recreation industry annually generates over $887 billion in consumer spending that supports more than 7.6 million jobs and rakes in over $124.5 billion in federal, state & local taxes, making it one of the nation’s most lucrative investment ground. It goes without saying that the UTV market accounts for a sizable chunk of this thriving industry. Unlike other off-road vehicles recreational UTVs are a unique blend of comfort & power, wherein the vehicle operator can perform any of the off-road activities with considerably more comfort. Moreover, UTVs also boast of larger cabin spaces that allow for greater number of passengers and also come with superior safety features such as roll-cages & bucket seats, giving these vehicles an edge over other off-roaders & further supporting market growth by eliminating the customer hesitancy factor in terms of vehicle safety. Traditionally ATVs were used to carry out a majority of agricultural activities, ranging from hauling fertilizer, wire & lumber, however, these practices were quite inefficient in terms of getting work done & lessening physical effort as the vehicle’s small size limited its load bearing & hauling capacity and the lack of power steering made the task very strenuous for the vehicle operator, defeating the purpose of using the vehicle in the first place. These limitations have started to drive individual farmers & other agricultural corporations away from ATVs, and most of them now prefer to invest in well-equipped UTVs, further propelling UTV adoption across the utility landscape in recent years. Apart from offering these benefits, the UTVs also comfortably sit between a basic quadbikes (ATV) and a fully-fledged tractors or pickup trucks, thus, providing the UTV market with ample growth opportunities from agriculture, without having to compete with others for the position. Moreover, unlike their bigger as well as smaller counterparts, the UTVs, owing to the diverse array of accessories & additional attachments available in the market, can perform different activities ranging from transporting supplies and mowing grass to managing livestock and plowing the fields, ensuring their dominance across the field of agriculture. Thus, powered by their deployment in agriculture and landscaping activities, UTV industry size from the utility sector is slated to depict a CAGR of 6% over 2019-2025. As is evident from the aforementioned trends, the global UTV market has clearly positioned itself in an extremely lucrative spot and is bound to exhibit sustained growth in the ensuing years. 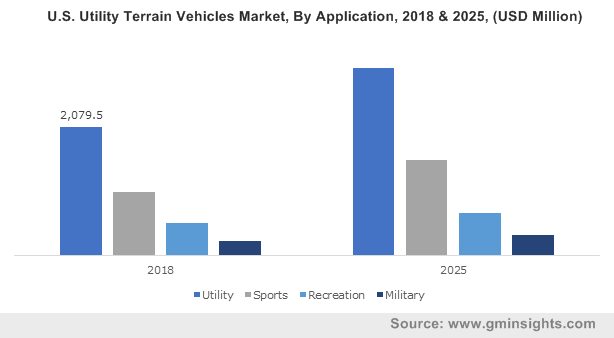 The growth prediction is further supported by a research report from Global Market Insights, Inc., which estimates that the global UTV market size would be surpassing the $9 billion renumeration mark by 2025. This entry was posted in Automotive & Transportation and tagged Displacement, Military, Recreation, Sports, Utility, Utility Terrain Vehicles Market, Utility Terrain Vehicles Market Analysis, Utility Terrain Vehicles Market Size, UTV Manufacturers, UTV Market, UTV Market Outlook, UTV Market Share, UTV Market Statistics, UTV Market Value.